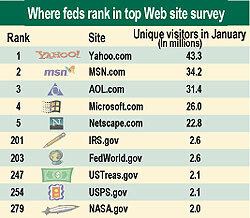 Fifty government Web sites rank among the 600 most popular on the Internet, according to a recent survey. Of those sites, five ranked among the top 300 domains. The government's showing in the January survey ratings of 2,200 sites'which include top news, entertainment and shopping sites'indicates that agencies are doing a good job of presenting public information on the Web. Although large commercial portals are visited more often than federal sites, five agency domains recently were among the most-visited 300. The data came from a representative sample of 50,000 people who agreed to let Media Metrix of New York track their Web surfing habits at home and at work. Media Metrix, which measures Internet and digital media usage, extrapolated the data so it could represent the habits of millions of other Web viewers. The numbers in the third-party survey may differ, however, from the page-view logs maintained by government Web sites. Media Metrix records traffic by domain name, not by uniform resource locator. That means visitors could browse on several different servers or subdirectories and still have their traffic credited to the main domain. The No. 1 federal site in January was the IRS home page, at www.irs.gov. It usually makes the government's top 10 but jumped to first place as the tax filing season neared. The ranking of the Treasury Department site, at www.ustreas.gov, also rose in the survey, perhaps for the same reason. The government top 10 also included consistent federal favorites such as NASA's site, which has numerous subdomains including education.nasa.gov and nasajobs.nasa.gov. Other popular federal sites include the Postal Service's and the FedWorld gateway maintained by the Commerce Department. There were two state domains in January's government top 10: the sites for California, at www.ca.gov, and for Texas, at state.tx.us. California is one of the most wired states, and Texas Gov. George W. Bush is seeking the presidency'two factors that likely helped draw visitors to the sites. Others that made the top 600 list but were not among the top 10 in the government category were the sites of the Library of Congress, the House of Representatives, the CIA and the California Health and Human Services Agency. Although the survey measures 50,000 users, some might be inactive in any given month. The Media Metrix 'reach' figure for a domain is the percentage of the sample who visited the site. Each of the Net's top four sites, the Web portals of Yahoo Inc., America Online Inc., Microsoft Corp. and Lycos Inc., has millions of page views daily. Their reach numbers run at 45 percent to 65 percent. Government sites fall well below those figures. The IRS' reach, for example, was 3.6 percent. All government sites combined had a Web reach of 35 percent for January, up from just below 30 percent in December. That means 35 percent of the people in the study visited a government site at least once in January. A user tracked by Media Metrix is counted as one unique visitor even if the person visits the same site 500 times. Multiple visits per month are counted and averaged, based on the total number of visitors. The highest average number of visits in January belonged to the Army's www.army.mil, at 2.8 visits. The highest number of pages viewed per visit was at the Education Department's site: 15.5. The government as a whole averaged 7.3 pages, which is a high number of views; Web portals generally serve up three to six pages per visit.